The Indigenous People of Biafra have vowed that the restoration of Biafra is a mission that must be accomplished either through peace or otherwise. This statement was made available to Family Writers during the one year anniversary in commemoration of the illegal detention of Nnamdi Kanu, by a top Official of IPOB. "We have marked 365 days of abduction of the leader of Indigenous People of Biafra, Mazi Nnamdi Kanu, who has been illegally detained with all manner of humiliation and violation of his fundamental human rights, as well the right of Indigenous People of Biafra as stated in Africa human rights charter which Nigeria is signatory to. "We have been following the court proceedings and the shameful games being played by the Nigeria government. We monitor their move and how desperate they have been to kill Nnamdi Kanu," he said. "We are making it clear that if Nigeria government keeps on playing this game of shame, then we will swing into action. Nigeria government should understand that although we have not applied any other force except our peaceful protest, nevertheless this time everybody in Nigeria will know how fanatic we are towards the freedom of our leader Mazi Nnamdi Kanu and the restoration of Biafra. "It is either we do it in a peaceful way or war. We have humbled ourselves to wait for the court proceedings, but our patience is running out. "Do you think that after the killings of our people in various places, and torture and clamp down on our innocent brothers, we will still lives as one? "Nigeria government must pay for these killings of our people. Nigeria government should understand that indigenous people of Biafra is not a political party. All the so-called South South and South East governors should henceforth be out of our ways, and stop arresting and humiliating our people. 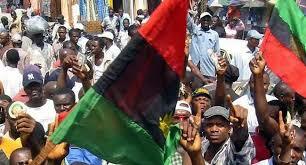 Biafra restoration is a mission that must be accomplished by any means possible." He concluded.